As you might imagine, food blogging can be a bit solitary. I work from home. I have no co-workers, unless you count my cats. Some days it’s just me and the kitchen and the internet. But, food blogging also has allowed me to meet some lovely people who share my passion for baking, cooking, and good food. Today, I’m so excited to be celebrating with one of my blogger friends. 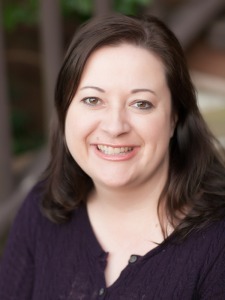 Some fellow bloggers and I are having a surprise baby shower for Audra of The Baker Chick. Surprise, Audra! She’s expecting a baby boy in January, and I couldn’t be more thrilled for her and her husband. Okay, now on to my contribution to this virtual shower. It’s probably not surprising that I’m the girl who shows up to the party with chocolate. What can I say? I aim to please. Anyway, when I make dessert for a gathering, I like to make mini treats so there’s no slicing and serving to be done. I hesitate calling these cupcakes. They aren’t actually much like cupcakes, but the presentation is there so we’ll go with it. 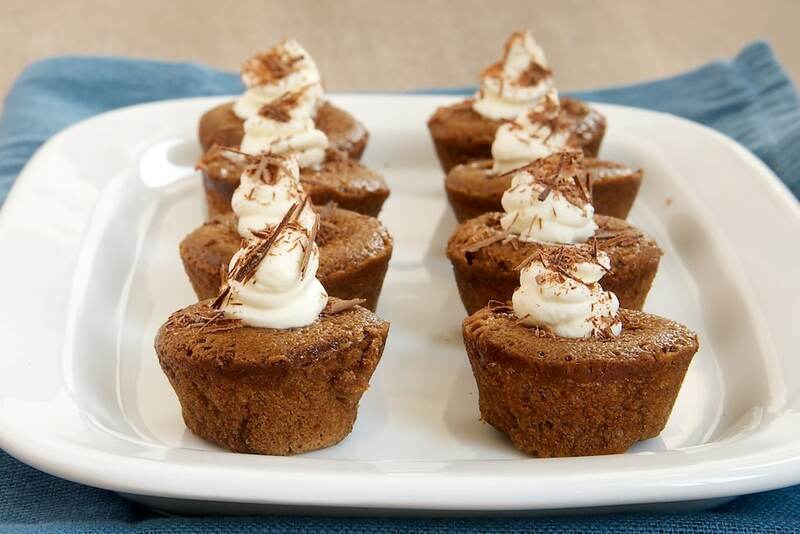 As the rest of the name implies, these are like little bites of chocolate mousse. Hard to argue with that. 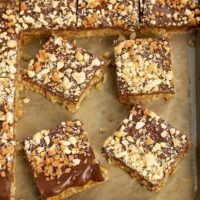 The most amazing thing is that you can make these with just four ingredients. If you’re busy like I am this time of year, these kinds of recipes can be life-savers. Just top them off with some sweetened whipped cream, and you’ve got a beautiful plate of tiny, lovely desserts. I added a bit of vanilla extract, although I really wanted to use a little liqueur. This being a baby shower, I thought vanilla was the safer choice. 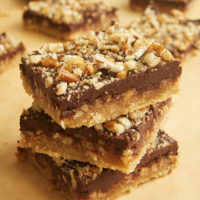 But, I think these would be just lovely with a coffee liqueur or hazelnut liqueur. I have a couple of bits of advice for you. First and foremost, these will only be as good as the chocolate you put in them. Secondly, the original recipe recommended lining the muffin cups with paper liners. I made them both with and without liners, and I found that the cupcakes tended to lose their shape in the liners. Stop by The Baker Chick to congratulate Audra. And, click the links below to see what everyone else made to help Audra celebrate. Oh, how I wish we were all really getting together to share all of this deliciousness! 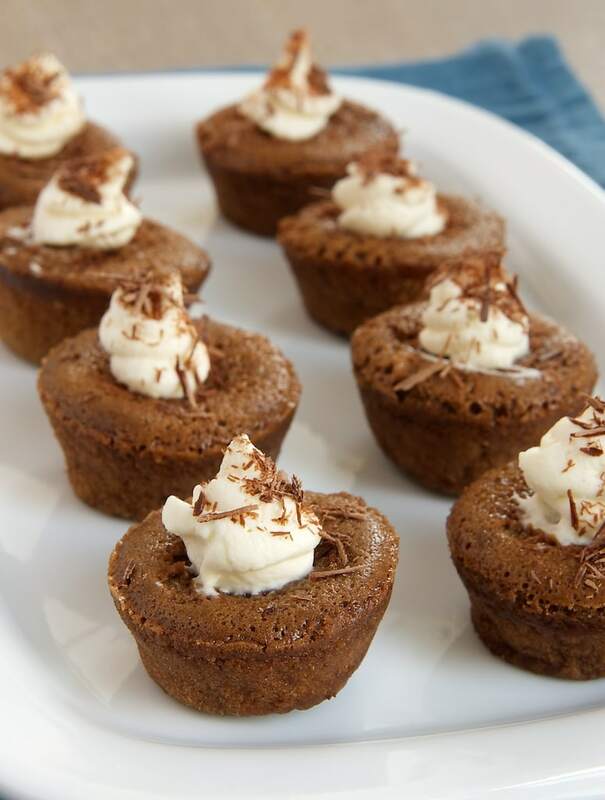 Chocolate Mousse Mini Cupcakes take the popular classic and turn it into little bites of baked chocolate goodness made with just four ingredients. Preheat oven to 325°F. Grease 48 mini muffin cups. Place the chocolate in a microwave-safe bowl. Heat at half power in the microwave in 30-second increments until the chocolate melts when stirred. Stir until smooth. Set aside to cool slightly. Place the eggs and flour in a large bowl. Beat until combined. Add the chocolate and beat until thoroughly mixed and smooth. Mix in the vanilla. 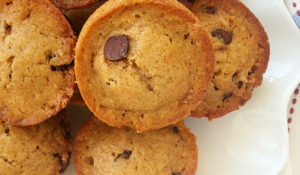 Fill muffin cups about 2/3 full of batter. Bake 8 to 10 minutes, or until the edges are browned and centers shake slightly. Cool in the pan on a wire rack for 20 minutes. Then, carefully remove from pans and cool completely. Run a knife between the pan and the cupcake to loosen the cupcake if necessary. Garnish with whipped cream and chocolate shavings before serving. Recipe slightly adapted from MyRecipes. Aw Jen these are so beautiful- thank you so much for bringing them to my “shower” 🙂 They look so fluffy and spongey and rich- perfect for my sweet tooth that is growing every day!! I love chocolate mousse, and the fact that you’ve put it in an individual serving size is genius! What a nice dessert for a virtual baby shower! I have a thing for mousse that I only discovered a couple years ago. I would devour these. These look DIVINE! I love that they’re made with so few ingredients and are mousse-y. I just got some silicone molds that will work wonderfully with this recipe, and with so many eggs it’ll easily adapt to being gluten-free. Lovely! So pleased to work on Audra’s shower with you 🙂 I also freelance from home, and get the isolation that sneaks in after a while. These relationships are such a joy! Those look great. One of my favorite groups to bake for ADORE bite-sized. Their argument is “mini sized always justifies another one”. HA I love that kind of logic. Music to a baker’s ears. Can’t wait to make these for them (after the other 50 you’ve already encouraged me to bake!). And thanks for the other suggestions and links from the event. 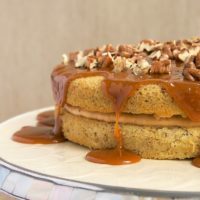 Like I need another baking site to encourage me to bake more at this time of year but I love finding new sites and great bakers like you to give me more ideas and fun. Thanks, Jennifer. 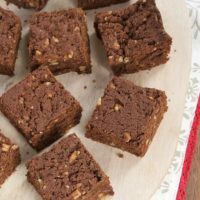 I came running when I saw this recipe. Well figuratively running, as you pointed out, blogging is pretty virtual. 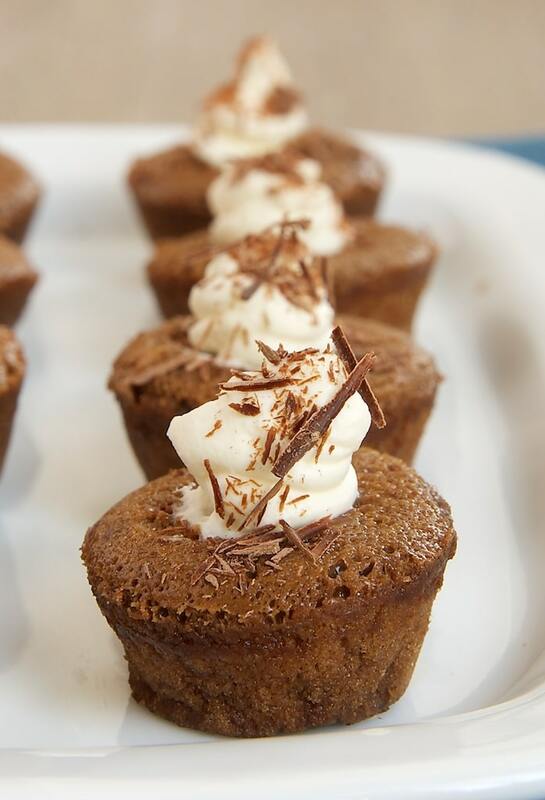 Chocolate mousse in cupcake form? Great idea! With the word mousse being in their name, I can only imagine how heavenly these must taste! We all thank you for bringing the chocolate Jennifer…it is an essential flavor! I seriously need more mini chocolate things in my life. This sounds awesome!! Oh yum, I haven’t had chocolate mousse in forever but it is the best! 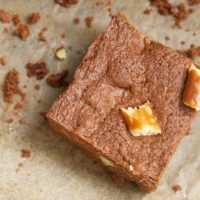 Love the simplicity of this recipe, it’s perfect for this crazy busy month! 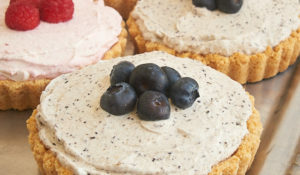 I don’t think it really matters whether you call them cupcakes or mousse bites, the excellence in flavor will probably be the same! These look fantastic! These are for SURE the perfect bite – LITERALLY. So rich!! Love em. And yeah, the blogging friends make the solitary moments totally worth it! These sound delicious! 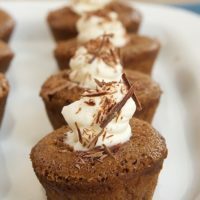 Chocolate Mousse mini cupcakes steal my heart just by the name then those pictures <3,<3 ! 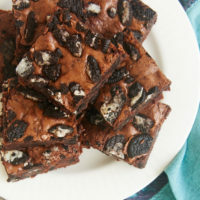 I will definitely be making these this weekend! Yummy! These are the perfect bites! I love Audra and I LOOOOOOOOOOOOOVE how decadent and delicious these little mousse cakes look!! I love mousse! I can’t believe you turned it into cupcakes! Yum. i made these yesterday and i was so excited about that! mine came out more of a cake consistency instead of mouse? any ideas what i can do next time to ensure that they have that mousy deliciousness??? THANKS! Hi …please tell me which milk chocolate do we use here. 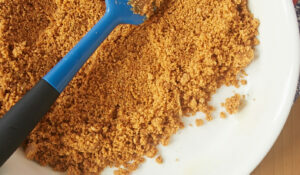 ..the one that we buy to eat off the shelf or the milk chocolate that we use for cooking. I am desperate to try this recipe!!! Either should work, but baking chocolate is often easier to melt.